The Hoffer Teflon Series Turbine Flowmeters are designed and manufactured for process chemical and corrosive service flow measurement. The Teflon meter is selected when chemical compatibility is critical in the flow application. Recommended for corrosive service and ultrapure water flow applications. Suitable for clean liquid service at one centistoke. 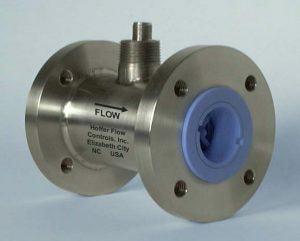 Flow rate capability from 0.35 to 485 GPM, (¼” through 3″ sizes). Mates with RF flanges per ANSI or DIN flanges. For customers measuring the flow of corrosive liquids, ultrapure water and chemical applications.